Purchase an Adult Clipper card at a TVM for $3 at select light rail platforms. Load Clipper e-cash value, VTA Monthly Pass, or other transit agency passes. Redeem a VTA Token for a Day Pass. *Valid on light rail only. 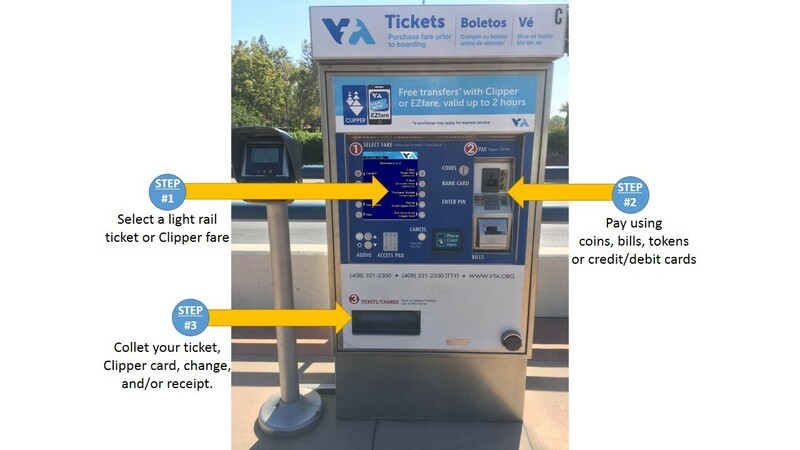 VTA operates on a proof-of-payment system. Please present your valid ticket when requested by a Fare Enforcement Officer. "2-Hour Single Ride" - a Single Ride ticket purchased from a TVM is valid for light rail only and is valid for two hours starting from the time and date of purchase. "8-Hour Excursion Pass" - an Excursion Pass purchased from a TVM is valid on light rail only and is valid for eight hours starting from the time and date of purchase. "Buy an Adult Clipper Card" - New! Customers may purchase a Clipper card for $3 and load Clipper cash value or passes in one transaction. "Add Value to my Clipper Card"
"Use Tokens" - place a VTA Token into the coin slot to exchange for a Day Pass. Insert payment. TVMs accept coins, $1, $5, $10, $20 bills, day pass tokens, and credit and debit cards (Visa, MasterCard, Discover and American Express). Collect your ticket, Clipper card, change, and/or receipt for credit/debit transactions. Note: TVM's are not Clipper readers, so riders must still tag their Clipper card before boarding a light rail vehicle.